Define all the settings required for membership, roles, and profiles in web.config. Create the login box on the master page, and the "access denied" page. 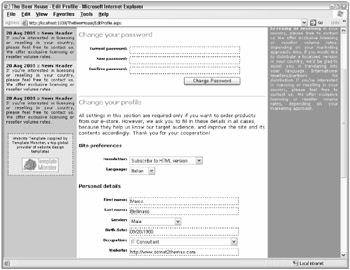 To test the login process before creating the registration page, we can easily create a user account from the ASP.NET Web Administration Tool. Create the registration and profiling page. Create the password recovery page. Create the page to change the current password and all the profile information. Design profiles to save the user's favorite theme, and handle the migration from an anonymous user to an authenticated user so we won't lose his theme preference. Create the administration pages to display all users, as well as edit and delete them. As you can see, a provider is defined and configured for all modules that support this pattern. I specified the provider settings even though they are often the same as the default providers found in machine.config.default, because I can't be sure whether the defaults will always be the same in future ASP.NET releases, and I like to have this information handy in case I might want to make further changes someday. To create these settings I copied them from machine.config.default, and then I made a few tweaks as needed. In order to configure the cryptographic keys, we need to set the validationKey and decryptionKey attributes of the machineKey element. Because we are configuring the membership module to encrypt passwords, we can't leave them set at AutoGenerate, which is the default. You can find some handy utilities on the Internet that will help you set these values. 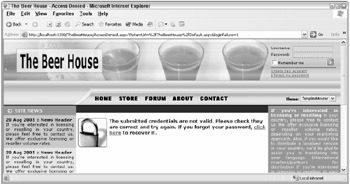 You can check the following Microsoft Knowledge Base article for more information: http://support.microsoft.com/kb/313091/. This article shows how to implement a class that makes use of the cryptographic classes and services to create values for these keys. Alternately, if you want an easier way to create these keys, check out this online tool: www.aspnetresources.com/tools/keycreator.aspx. I want to reiterate a point I made earlier in this chapter: If you'll be deploying your application to a web farm (more than one web server configured to distribute the load between the servers), then you need to specify the same machine keys for each server. In addition to password encryption, these keys are also used for session state. By synchronizing these keys with all your servers, you ensure that the same encryption will be used on each server. This is essential if there's a chance that a different server might be used to process the next posting of a page. You have full control over the appearance of the produced output, and you can change many aspects of the behavior. For example, our custom template can be used with validator controls, and you can set their SetFocusOnError property to true (this defaults to false in the default template). This property is new to ASP.NET 2.0 and specifies whether the validator will give the focus to the control it validates if the client-side validation fails. This is desirable in our case because we want the focus to go to the first invalid control after the user clicks the Submit button if some controls have invalid input values. If you don't redefine the TextBox controls, the SetInputControlsHighlight method we developed in Chapter 2 will not find them, and thus the textboxes will not get the special highlight behavior that gives users a visual cue as to which TextBox currently has the focus. <asp:HyperLink ID="lnkProfile" runat="server" Text="Edit Profile"
Absolutely no code is needed in the master page's code-behind files. In fact, because we used the right IDs for the textboxes and other controls in the template sections of the Login control, it will continue working autonomously as if it were using the default UI. To test the control, first create a new user through the ASP.NET Web Site Configuration Tool described earlier, and then try to log in. In Figure 4-14 you can see what the home page looks like from an anonymous user's and an authenticated user's point of view. Of course, you can test the sitemap-controlled menu by assigning the Administrators role to your sample user. You can even do this role assignment from the online configuration application! 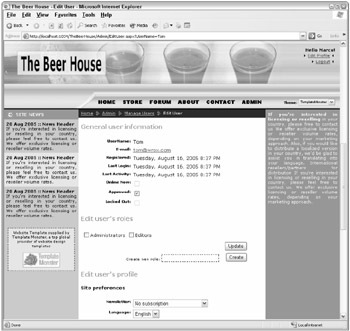 <%@ Page Language="C#" AutoEventWireup="true" CodeFile="AccessDenied.aspx.cs"
Inherits="AccessDenied" Title="The Beer House - Access Denied"
<a href="Register.aspx">click here</a> to register now for free. If the querystring contains a loginfailure parameter set to 1, it means that the user tried to log in but the submitted credentials were not recognized. If the user is not authenticated and there is no loginfailure parameter on the querystring, it means that the user tried to access a page that is not available to anonymous users. If the current user is already authenticated and this page is loaded anyway, it means the user does not have sufficient permission (read "does not belong to a required role") to access the requested page. Figure 4-15 is a screenshot of the first situation — note the message by the image of the padlock. <asp:ListItem Text="Subscribe to plain-text version"
The DropDownList control has the AppendDataBoundItems property set to true. This is a new property of ASP.NET 2.0 that allows you to specify whether the values added to the control via data-binding will be added to those defined at design time, or will overwrite them as is done with ASP.NET 1.x. Also note that the user control has no Submit button, as this will be provided by the hosting page. Define the property so that it uses a private field to store the value. Call the parent page's RegisterRequiresControlState method, from the control's Init event handler. This notifies the page that the control needs to store some control state information. Override the control's SaveControlState method to create and return an array of objects you want to save in the control state. The array values consist of the property values you need to be persisted, plus the base class' control state (this always goes into the array's first slot). Override the LoadControlState method to unpack the input array of objects and initialize your properties' private fields with the values read from the array. This is somewhat more complicated than the older method of using the host page's view state, but you gain the advantage of independence from that page's configuration. You have to weigh the added complexity against the needs of your application. If you'll have a large application with many pages, it is probably wise to use control state because you can't be sure if one of the host pages might have view state disabled (in a large system it's almost guaranteed that some pages will have it disabled). Also, if your controls might be used by other applications within your company, or even other companies, you should definitely use control state to give you the added peace of mind to know that your controls will always work. ErrorMessage="Password must be at least 5 characters long." ErrorMessage="Password and Confirmation Password must match." site and its contents accordingly. Thank you for your cooperation! This example is e-mailing the username and password because this is a low-risk site and we chose user-friendliness over the tightest possible security. Besides, I wanted to demonstrate how to use placeholders in the body text file (<% UserName %> and <% Password %>). For serious e-commerce sites or in situations where your company (or your client) doesn't approve of e-mailing usernames and passwords, you should not follow this example! 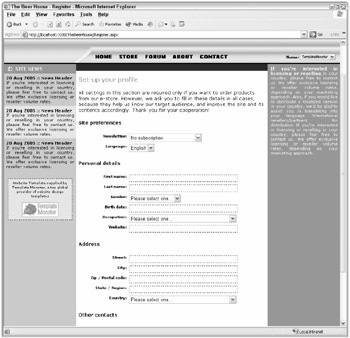 Figure 4-16 is a screenshot of the registration page on the first step of the wizard. Figure 4-17 shows the second step, enabling users to set up their profile. <%@ Page Language="C#" MasterPageFile="~/Template.master" AutoEventWireup="true"
The body of the mail sent with the credentials is almost the same as the previous one, so we won't show it again here. Figure 4-18 shows a couple of screenshots for the two-step password recovery process. accordingly. Thank you for your cooperation! Figure 4-19 shows part of this page at runtime. Now that the end-user part of the work is done, we only have the administration section to complete. 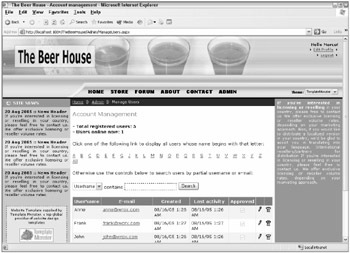 The ~/Admin/Default.aspx page linked by the Admin menu item is the administrator's home page, which contains links to all the administrative functions. First we will develop the page used to manage users and their profiles. To protect all the pages placed under the Admin folder against unauthorized access, you should add a web.config file under this ~/Admin folder, and write an <authorization> section that grants access to the Administrators role and denies access to everyone else. In the "Design" section is a sample snippet to demonstrate this. The first part tells the administrator the number of registered users, and how many of them are currently online. The second part provides controls for finding and listing the users. There is an "alphabet bar" with all the letters of the alphabet; when one is clicked, a grid is filled with all the users having names starting with that letter. Additionally, an All link is present to show all users with a single click. The search functionality allows administrators to search for users by providing a partial username or e-mail address. 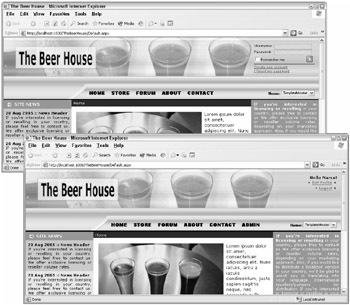 The third part of the page contains a grid that lists users and some of their properties. As you see, the alphabet bar is built by a Repeater control, not a fixed list of links. The Repeater will be bound to an array of characters, displayed as links. I used a Repeater instead of static links for a couple of reasons. First, this will make it much easier to change the bar's layout, if you want to do so later, because you need to change the template, not a series of links. Second, if you decide to add localization to this page later, the Repeater's template could remain exactly the same, and it would be sufficient to bind it to a different array containing the selected language's alphabet. Use BoundField columns (the GridView's version of the old DataGrid's BoundColumn) for the username, the creation date, and last access date. These values will be displayed as normal strings. Use a CheckBoxField column to show the user's IsApproved property by means of a read-only checkbox (this would have required a TemplateColumn in the old DataGrid, which would have been much harder to implement). Use a HyperLinkField to show the user's e-mail as an active link that uses the "mailto:" protocol to open the user's default mail client when the link is clicked. Use another HyperLinkField column to show an edit image that will redirect to a page called EditUser.aspx when clicked. This link will include the username on the querystring and will allow an administrator to edit a user's profile. Finally, use a ButtonField column to produce a graphical Delete button. If you set the column's ButtonType property to "Image", you can also use its ImageUrl property to specify the URL of the image to display. Before looking at the code-behind file, I want to point out another small, but handy, new feature: The grid has a <EmptyDataTemplate> section that contains the HTML markup to show when the grid is bound to an empty data source. This is a very cool feature because you can use this template to show a message when a search produces no results. Under ASP.NET 1.x, you had to write some code to check for this situation, and then hide the grid and show a Literal or a Label instead. The 2.0 solution is much simpler and more elegant. Note that the script is added only for rows of type DataRow. This requires an explicit check before the RowCreated event is raised, and for the header, footer, and pagination bars (when present). 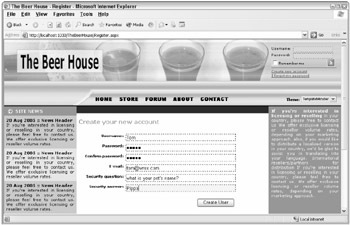 Figure 4-20 is a screenshot of this page, listing all current users. The first section shows the data read from MembershipUser. All controls are read-only, except for those that are bound to the IsApproved and IsLockedOut properties. For IsLockedOut, you can set it to false to unlock a user account, but you can't set it to true to lock a user account, as only the membership provider can lock out a user. The second section contains a CheckBoxList that displays all the roles defined for the application, and allows the administrator to add or remove users to and from roles. There is also a TextBox control and a button to create a new role. The third and last section displays a user's profile and allows edits to the profile, through the UserProfile user control developed earlier. When the Update Roles button is pressed, the user is first removed from all her roles, and then is added to the selected ones. The first remove is necessary because a call to Roles.AddUserToRole will fail if the user is already a member of that role. As part of the following code, you use a new feature in C# 2.0 called a generic list. This is a list collection that enables you to specify the datatype you wish to support for objects stored in the list. When you declare an instance of this collection, you have to indicate which datatype you want to store in it by enclosing it in angle brackets. Therefore, if you say "List<string>" you are asking for a list collection that is strongly typed to accept strings. You could have also asked for a collection of any other datatype, including any custom class you might create to hold related data. 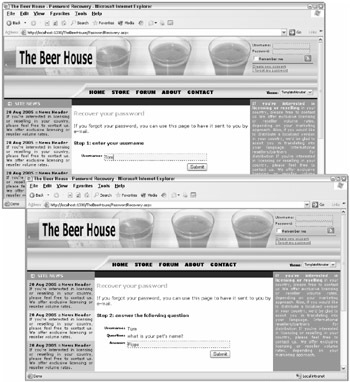 Figure 4-21 shows a screenshot of this page in action.